Stainless steel case with a stainless steel bracelet. Inner rotating slide rule bezel. Black dial with luminous hands and index hour markers. Arabic numerals mark the 6 and 12 positions. Tachymeter around the outer rim. Dial Type: Analog. Luminescent hands and markers. Date display at the 3 o'clock position. Eco-Drive B877 eco-drive movement. Scratch resistant mineral crystal. Screw down crown. Solid case back. Case size: 42 mm. Case thickness: 12 mm. Round case shape. Band width: 22 mm. Band length: 9.5 inches. Deployment clasp with a double push button release. Water resistant at 200 meters / 660 feet. Functions: hours, minutes, seconds, date, 12/24 hour display, dual time. Sport watch style. Watch label: Made in Japan. Item Variations: BJ7000-52E, BJ700052E, BJ7000, Citizen-BJ7000-52E, Citizen-BJ700052E. 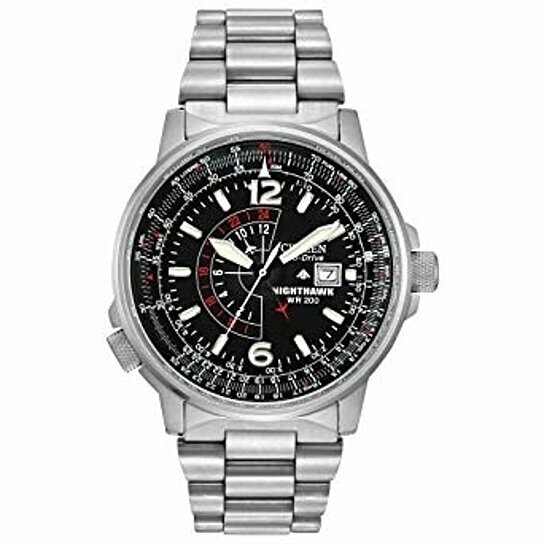 Citizen Nighthawk Eco-Drive Pilot Watch Men's Watch BJ7000-52E.